Casa Rainbow Canyon bed and breakfast is a quiet piece of Santa Ana’s real estate, offering private accommodations. It consists of seven bedrooms and two complete one-bedroom apartments. It is located right between Santa Ana and its neighbor Escazú which are among the most coveted areas of Costa Rica real estate; very close to some of the best restaurants, cafes, and boutiques in the country, to CIMA, a state-of-the art hospital that attracts medical tourism, and the Jazz Café, a favorite of jazz, blues, and rock music lovers. Casa Rainbow Canyon is a cozy, tropical heaven, with a fishpond and purple floating flowers, orchids, an adorable parrot and a pooch, and a spectacular view of the Virilla River Canyon. You can enjoy it from the swimming pool, pool bar and other communal areas such as the welcoming, kitchen-dining-leisure areas, its gardens and balconies, etc. There are numerous corners for reading, or peace and quiet lovers. Among Santa Ana properties, its inns and hotels, you cannot find a more laidback atmosphere. The bedrooms are spacious with an elegant décor and bright, private bathrooms. Surrounded by vegetation, it is a happy corner in a busy world, with a secure, enclosed parking area. It’s a discreet environment for every kind of tourism, from where you can branch out to the beaches in the Pacific Coast like Jaco, Manuel Antonio, and many more. You might want to visit the capital city with its jewel of a National Theater and the underground Gold Museum. Or you can take excursions to volcanos, coffee plantations, or the Lancaster Gardens. For the adventurous, expert advice is available should you wish to try water rafting, surfing, crocodile-bird-whale watching, or the canopy. 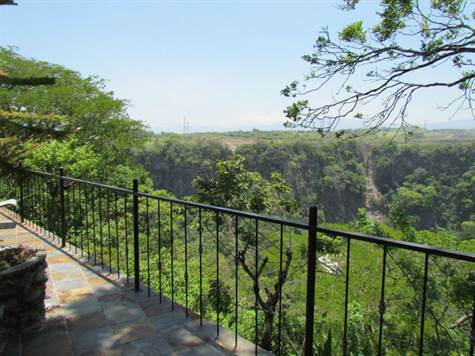 Coldwell Banker Santa Ana Real Estate is very pleased to welcome Casa Rainbow Canyon to its Costa Rican, B&B sale listings. Let us introduce you to a quaint, little piece of paradise. Available as a licenced B&B or your casona in paradise.